You have a feeling in your bones. After countless failed connections and dashed hopes, your heart is telling you this could be the day you meet your soul mate. There’s just one little problem … what if your soul mate doesn’t speak the same language as you? Directed by Neda Morfova. The infectious song is “Sitting on the Fence” by Bulgarian pop star Milenita. Principal cast: Radina Kardjilova and Dimitar Nedelchev. Breaking up is hard to do. A guy wakes up one morning to find out his girlfriend has dumped him, with the news being delivered in the strangest possible way. A singing barbershop quartet’s smooth and professional delivery does nothing to soften the blow. Directed and written by Shane Morton. 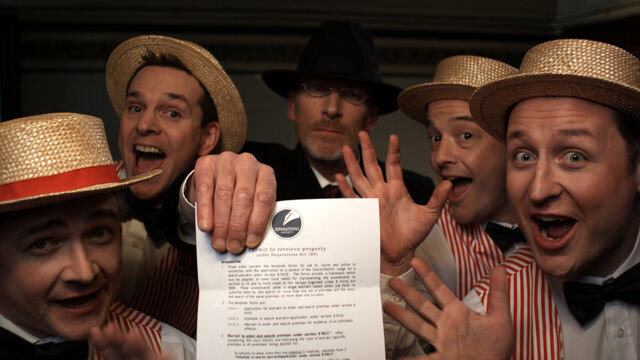 Principal cast: Oddie Braddell, Vincent Fegan, and The Jolly Sunbeams. There are times in all our lives when you just want to scream. There are other times that are filled with awkward silences. Some situations contain both. This is one of them. Written, produced, edited, and directed by Roberto Perez Toledo. Principal cast: Fran Rodriguez Castillo and Ruth Armas. A simple story about love and glue, but not just any glue. This special glue has extraordinary bonding properties for a husband and wife whose relationship has lost its magic. Produced, edited, and directed by Elizabeth Orne. Principal cast: Will Brill and Katya Campbell. – To watch the film again, go to nds.shootonline.com. After Dan and Natalie meet on a dating website they decide to go a step further and have a video date. Romance seems destined, but fate has other plans. The modern day fable exposes the disadvantages of matchmaking using the latest technology. Written and directed by Jennifer Leacey. Principal cast: James Mackay, Kate Mulvany, and Dan Krige.